From September 25, 2012 through January 27, 2013, the McNay Art Museum in San Antonio is featuring the exhibition “Estampas de la Raza: Contemporary Prints from the Romo Collection,” celebrating the recent gift to the McNay of works from the collection of Harriett and Ricardo Romo. Because the Romos have been ardent supporters of our organization, a large portion of the collection consists of Serie Project prints. This survey of Mexican American and Latino printmakers chronicles the late 1960s at the outset of the Chicano Movement to the confident expressions of the 2000s. 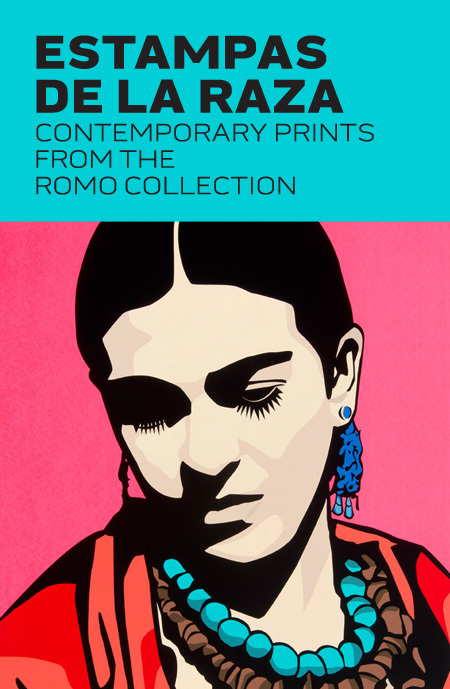 More than 60 prints by 44 artists reveal the richness of a mixed cultural heritage, with depictions of Frida Kahlo, lowriders, the Statue of Liberty, tattoos, and the Virgin of Guadalupe. Organized thematically in five sections, both the catalogue and the exhibition focus on aspects of the Latino experience in the United States: the identity of individuals striving to define themselves; the Chicano Movement’s struggle to achieve economic, political, and personal equality; tradition, memory, and culture in the everyday lives of Latinos; icons that serve as guideposts; and other voices revealing the complex and ever-changing directions Latinos choose. Many images are larger than life, serving up a colorful, visual feast. Read more about the story behind the Romos’ history of art collecting – on the McNay Art Museum website.